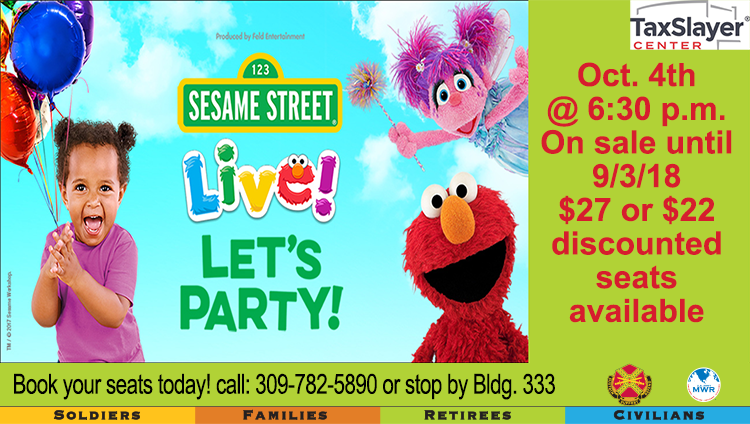 Date: Oct 4 2018, 6:30 p.m. - 8:30 p.m.
Jump to the beat with your friends on Sesame Street! Introducing an all-new, interactive show that unfolds on one of the world's most famous streets at the funniest, furriest party in the neighborhood... get ready for Sesame Street Live! Let's Party! Leisure Travel has your discount tickets for $22 & $27 each. Call 309-782-5890 or stop by Leisure Travel in bldg. 333 to get yours.